At Nature’s Best, we keep 75 active bee hives which generate the sweetest and most pure honey you can find. We offer 100% raw, unfiltered, unpasteurized local wildflower honey. 2018 prices are: $6 for one pound; $15 for three pounds; $25 for five pounds. Until the June 2019 honey harvest, we are not selling bulk quantities. If you are in need of bulk quantities, please call to place an order for June 2019. Otherwise, feel free to stop by our self-serve honey barn to grab a few jars for gifts or call us directly at 815.765.2960 and we’d be happy to ship you any amount you’d like. Nature’s Best is proud to announce the availability of Tolerance Honey™. Tolerance Honey™, a proprietary combination of 100% raw honey containing spring, summer and fall pollens, provides the same natural pollens as those in allergist-prescribed vaccines, shots and sublingual drops. Oral allergy drops containing pollen have been used for over 100 years by medical professionals to treat the symptoms of hay fever (allergic rhinitis). It includes entomophilous pollens (from nectar bearing plants) and non-nectar anemophilous windborne pollens (from trees, weeds and grasses which account for approximately 90% of hay-fever allergies) that enter our hives on air currents or adhere to the honeybee due to its electrostatically charged nature and then settle into uncapped honey. As pollen taxa may vary from season to season, a listing of primary pollens identified in the current Lot is available upon request. 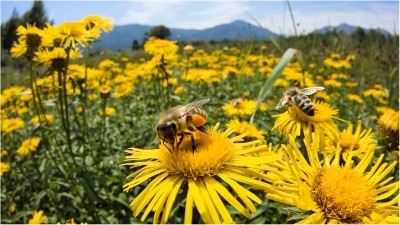 Please visit www.tolerancehoney.com to order or stop by our self-serve honey barn.